I have tried several methods to remove unwanted hair ranging from tweezing to IPL hair removal (Intense Pulsed Light) so hair removal creams is not an exception. The one I've tried is Veet hair removal cream. The moment I saw it on the racks I became curious so I picked it up. The price at that time is around PHP 100. 1. Squeeze enough cream on the spatula which comes with the product. 2. Spread it evenly on the area where you want your hairs to be removed covering all the unwanted hairs. 3. Let it sit for 3 minutes. 4. Using the head of the spatula provided, test a small patch to make sure your hair comes away easily from the skin. If needed the the cream a bit longer but not exceeding 6 minutes. 5. Make sure you remove the remaining cream by rinsing the area thoroughly under water. 6. Take a towel and pat the area dry. 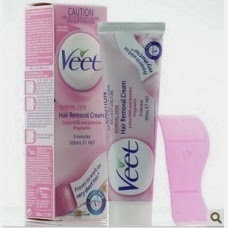 Here's a video on how to remove the unwanted hairs using Veet hair removal cream. Note: Do not use deodorant or shave the area after using Veet Hair Removal Cream. Be patient and wait for 24 hours else you'll suffer from painful rash. Leaves a lingering smell for a few hours after application. During the application, it stings mildly and the skin tingles. I don't recommend this to those who have sensitive skin. It works! I find it amusing how a cream can remove those unwanted hairs after doing the steps mentioned above. It does the job but I'm a bit worried applying it to my skin in the long run because the chemical in the product that helps melt unwanted hairs might give me side effects or allergic reactions. So it's really important to follow the instructions given. Wash it thoroughly after application and DO NOT leave the cream on your skin for more than 6 minutes because it might irritate your skin. There are a few small hairs shafts left behind but I guess its normal. I also find it a bit tiring raising up my arms just to wait for 3 - 6 minutes to remove the cream with the unwanted hairs. And I'm a bit concern if some of the creams might stick on my hair of my head. Overall, I find this method messy. Good, if it works for you but it's not for me. How about you? What do you think? Let me know. Check out my post on Phillips Satin Soft Epilator HP6519/01.